It’s been a while since I’ve posted anything. The table project has been side tracked for a while, due to some health issues but I’m back at it now. The three pedestal bases are finished. Thank you, and I’m doing just fine now. Holy… that is impressive. Can’t wait to see the finished product. Wow Lee thats looking spectacular! I have to agree with all the above. The whole project is going to be out of this world. Lee, that is nothing but amazing. looks amazing…and cool website too!!! Even good reasons for delays get old! I was just looking at your entertainment unit. Looks to me like you have plenty of talent. Howdy Lee.. Now that’s what im talkin about!!.. That looks unbelieveable!.. Now you know why I bug you all the time for advise..you make stuff like this!..lol.. On another note.. Im worried about your health. I hope and pray your ok and well.. I sure could have used your carving talents on this. 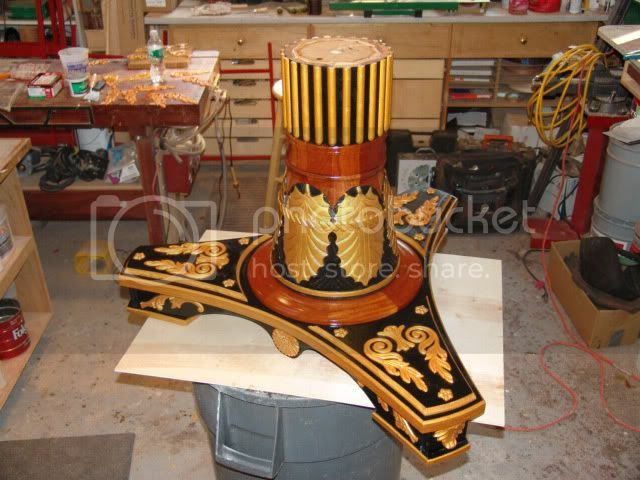 That pedestal is absolutely beautiful! I always enjoy your work. I am glad you are feeling better.